Dr. Lina Cardona is a board certified family physician who specializes in dermatology. 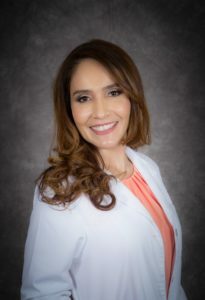 She received her medical degree from University of Antioquia in Colombia and served as chief resident at Texas Tech University Health Sciences Center in El Paso. She graduated from Texas Tech with honors in 2014 and completed her dermatology fellowship at University of Texas Health Science Center at San Antonio. She has participated in over 25 dermatological clinical studies, has been published in medical journals, and has collaborated on abstracts and graphic presentations about dermatological conditions. Additionally, she co-authored a chapter on derma fillers for the dermatology textbook Office-Based Cosmetic Procedures and Techniques and authored several chapters on skin pathologies in the textbook Color Atlas of Family Medicine, 3rd Edition. Dr. Lina Cardona is committed to providing integral dermatological care for her patients. She has the experience and knowledge to treat a wide variety of skin diseases and to perform surgical and cosmetic procedures.